We've had way too many threads of late that are a bunch of nonsense . I thought it might make sense to start a thread with some substance, namely in the form of pics. Below is a collection of double breasted suit pics that I've collected over the past couple of years. Please free to include any you might have. I've tried my best to include pictures that I've found in places other than the forums. I would be interested in the groups thoughts about them, likes and dislikes? What makes you wear them or stay far away? What is the ideal DB suit? Nice premise. I am not sure I like Bernard Kouchner's suit at all. I did enjoy the DB with spectators however. I guess my favorite is the 6x2... I don't like it when the lapel comes gorging down to button ie. the 1st two pics. I love double breasted suits. I only have ten or so. I would make up almost all my suits double breasted but they aren't always practical for what I need them for. I think that in England, although they aren't that popular right now, no one would bat an eye lash at them. In NYC, they tend to represent independent, successful, powerful men, or men that just love clothes. Sometimes, they can be a distraction both for wearer and observer. I find personally, those distractions are not only in business settings. Depending on the styling and cloths you pick, the double breasted can either be precious or very alpha dog. I am not sure I like Bernard Kouchner's suit at all. That's Luca di Montezemolo, but I do see a similarity. Especially rich are those cowboys who think they can, from one awkwardly posed picture, better determine how a garment fits than the owner who has actually worn it a number of times. Good idea and thread Bill. I'm a big fan of TCM movies from the 1930s and 1940s. It is very obvious that DB suits were much more common and in fashion then than now. It even seems like the vast majority of suits were DB then. I wonder if a sartorial historian like Sator, FNB, or perhaps Will or Manton would provide an explanation why DB suits were so popular back then. Was it just the vagaries of fashion? Or were there other factors too? BTW: I like DB suits but have bought less recently than I used to formerly. I like them slim and high-buttoning. I'd probably have to go bespoke to find the right fit for me, as the "younger" stores don't carry them and the older ones are going to be cut fuller. I agree about the perception of wealth and power, but I don't really give a damn - I'd wear one in a heartbeat. As to the pictures, I REALLY like the look of the black and white one, the guy flanked by two military fellows. Never seen one look so good open. The Frenchman looks like a clown and the Asian gentleman is just accentuating his dumpiness. Worst man-made disaster: January 20, 2009. Worst natural disaster: January 12, 2010. Is the first one a denim jacket? I have no idea, I would think not. Personally, I think double-breasteds look best in two styles. The first is the one like in that maybe-denim jacket--wide lapels and a shaped waist. The other type is a slim, more columnar look rather like a nautical jacket with slimmer lapels. Personally, I think Prince Michael of Kent's DB are very well balanced. What makes you wear them or stay far away? 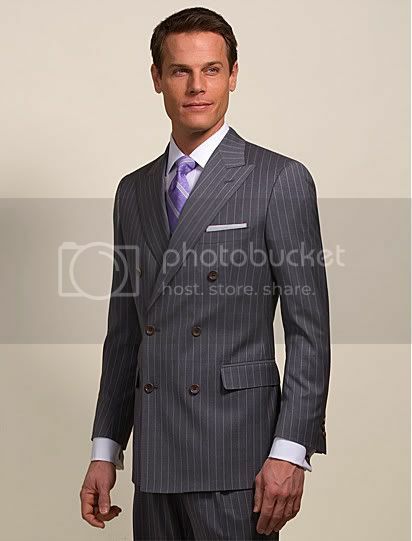 What is the ideal DB suit? I don't own that many suits, maybe 20. I would say that half of them are DB. I couldn't really tell you what makes me like them at least as much, if not more, than SB. Often times, I hear people say on the forums: Young guys can't wear DB. I can't understand this. I turned 29 yesterday and have worn them for at least 4 years. I feel just as comfortable wearing DB as SB.